We are always looking for ways to improve everything that we do and we have decided to distill our innovations and aspirations into a small group of chalets that each winter will host prototype ideas for the future. These are called our Development Chalets. Whilst we gauge your feedback and test the practicality of delivery, we are convinced that each of the subtle changes will enhance your holiday experience. Don’t worry, your holiday price remains the same. Food and drink is a fundamental centrepiece of life and never more so than during a skiing holiday. We are keen to improve the quality, consistency, variety and healthiness of our food whilst also concentrating on provenance, waste and animal welfare. This has proved very hard in the Alps ( … read impossible!) and so we are moving our Development Chalet kitchen to Kent … sounds completely mad I know, but bear with us and read on. Ed Perry & Dale Penfold’s founding principal when they created COOK in 1997 was to use the same ingredients and techniques that a good cook would use at home. Today their brand is a household name and their remarkable Kent kitchen provides nutritious food cooked by hand and using only natural ingredients. They care passionately about provenance, animal welfare and the environment. Best of all, by using innovative blast freezing techniques they have found a way of delivering this bundle of fresh excellence to kitchen tables all over the country. We are delighted to say that we are working with Ed, Dale and COOK’s Development Chef, Sarah Jane, to design a sensational VIP SKI chalet menu for 2018/19 that will be freshly cooked in Kent, blast frozen and then presented by your host at your chalet table in the Alps. This frees up your host a little to concentrate on the important stuff, like chatting to you, keeping the champagne cold, homemade chocolates and smoothies at breakfast. To enhance the experience further we are going to play with some other stuff as well, like carafe wine direct from some carefully chosen vineyards known well to us, Netflix casting on tap, improved minibars renamed TUCK SHOP with specialist beers and cider, old fashioned coke bottles and Green & Black chocs (all at a sensible price) and a few other small but significant embellishments. We think you will love the changes and whilst these enhancements will cost you nothing more (well, unless you choose to dive into the TUCK SHOP) the price you will pay is us asking a few more questions when you leave. We need to know what you loved and what makes little difference as we refine the changes to roll out to the rest of our programme. We genuinely can’t wait to share this experience with you so that you can help shape catered holidays of the future. We have selected three chalets in which to deliver these small but fundamental service improvements this winter. These chalets have been selected in different resorts and of varying sizes so that we can ensure any roll-out in the future can be sucessfully delivered across our whole porfolio of chalets. Chalet Nevada can be found right on the high street in the heart of Morzine, just 100m from the Super Morzine bubble and 300m to the nursery slopes. A cool contemporary interior boasts flat screen TV and WiFi throughout, not to mention cracking views of the resort and piste from the south-facing balcony. With three en suite bedrooms this is the perfect choice for a party of 6. The apartment is entirely independent with its own living and dining area and a dedicated chalet host. Bellevarde Lodge Muscat is an imposing stone-and-timber chalet situated just a few steps below the Santons piste in Val d’Isère; this means you really can click in and out of your bindings a few steps up from the ski room door. The chalet sleeps 12 in six en suite bedrooms, and boasts an open fire and outdoor hot tub. Chalet La Ferme is one of our most popular chalets in Alpe d’Huez and sleeps 10 guests. The open plan living/dining room has an open fire, surround sound TV, DVD and WiFi, each of the five bedrooms are en suite and all have balcony. For added luxury the chalet boasts a wet suite with sauna and hot-tub. 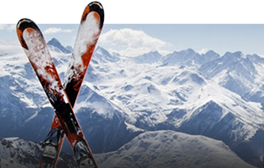 The chalet is located at the top of town, at an altitude of 2000m and surrounded on two sides by piste providing the ultimate in ski in – ski out convenience. Your three course evening meal kicks off with dishes like Winter Roast Vegetable Tart; Portobello mushroom risotto; Rainbow salad with a ginger & sesame seed dressing; Slow Roasted Tomato Tarte Tatin. Beef Bourguignon served with Dauphinoise potatoes and Cavolo Nero with Rosemary. Basil and Mascarpone Chicken served with lemon tagliatelle and roasted cherry tomatoes. Confit duck served with braised red cabbage and a creamy potato mash. Green Thai Chicken curry served with coconut and lime leaf rice.